Bought in Rochefort France, within spiting distance of Fort Boyard. 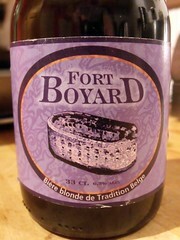 Fort Boyard, Blonde from France. 6.5% hazy gold colour with a good head, fruity slightly acidic aroma, strong alcohol taste.